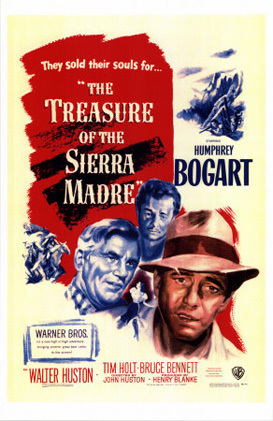 It does seem extremely odd hearing the distinctive sound of a kookaburra laughing its head off in the middle of the Mexican desert but the mighty John Huston uses this incongruous effect at one point towards the end of his black and white classic The Treasure of the Sierra Madre. It lends a certain mocking tone to the atmosphere surrounding his trio of gold prospectors who set off from a tin-pot town called Tampico to seek their fortune only to find themselves beset by destructive paranoia. The susceptible Fred C. Dobbs (Humphrey Bogart) is a down-and-out bum bludging money from strangers including an elegant man in a white suit – a cameo claimed by the director himself. In an attempt to change his fate around, Dobbs teams up with Bob Curtin (Tim Holt) and an old codger called Howard, beautifully played Huston’s own father Walter. The toothless Howard not only knows where they can find gold but also what it can do to men’s souls. Believing himself to be incorruptible, Dobbs dismisses Howard’s predictions and yet it is he who first succumbs to the inevitable tendrils of greed that reach out and wheedle their way into his psyche. Based on a novel by the mysterious B. Traven, the film contains classic punch-drunk bar fights, shoot outs with sombrero-wearing bandits and punishing treks through waterless arid zones. And every footfall resounds with a timeless warning about accumulating riches beyond one’s needs. It’s a stark morality tale that won Huston two Academy Awards for Best Screenplay and Direction, while his father took out one for Best Supporting Actor. However, the film reminds us that the gold that glitters in those prized little statuettes looks an awful lot like sand when you break it all down. It’s what’s in your heart that counts.